CD135, also called FLT3 or FLK2, is an integral membrane protein of 130 kDa to 150 kDa, which belongs to the receptor tyrosine kinase (RTK) family. These receptors directly bind extracellular ligands and transduce regulatory signals through intracytoplasmic tyrosine kinase activity. 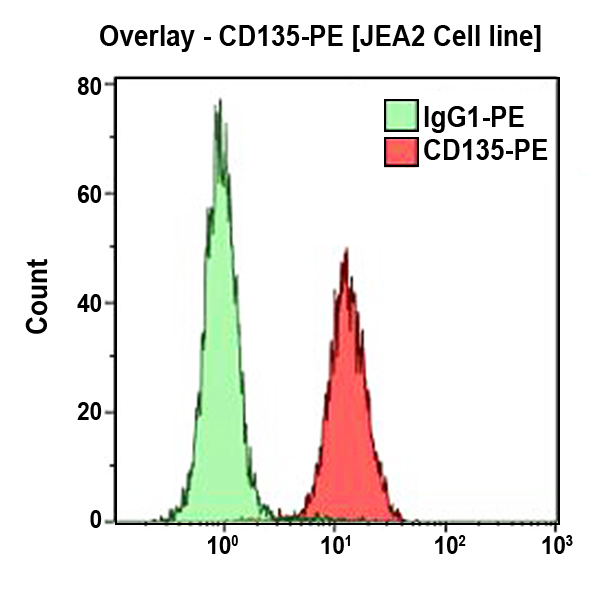 The CD135 antigen is expressed on myelomonocytic and primitive B cell progenitors. On normal bone marrow cells, expression of CD135 can be found on fractions of CD34+ as well as CD34- cells. Most of the CD34+CD135+ cells co-express c-kit (CD117) at high levels. Clone Description The SF1.340 antibody is specific for an extracellular domain of CD135. This antibody does not compete with the FLT3 ligand for binding to FLT3.